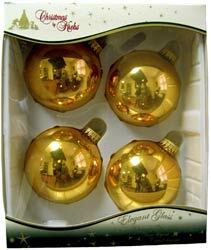 The Krebs Aztec gold ornament balls come with four 3.25 inch diameter ornament balls in each package. Each glass ball has a mirror like finish and come with gold hanger caps. They come in a nice box that can be used as storage from year to year.